Today’s post is all about your team. These are the people that lend their talents to assist you to make your business dreams and reality. Take a look at my points below. I hope they are helpful when you are hiring those vital members. Usually, a property manager is a person or company whose job is to make sure that things are in order for you and your renter. They are capable of providing you advice, assist you in managing your tenants, rent collection, and help you get the best value for your property. Property management companies should be able to assist you with property law as well as the rights and responsibilities of both you and your tenants. They can also handle maintenance problems. Except for emergency repairs, the maintenance costs should get your approval first in advance. Roles can also include assistance in finding the right tenants; doing background checks as well as making sure tenants pay rent in a timely manner. 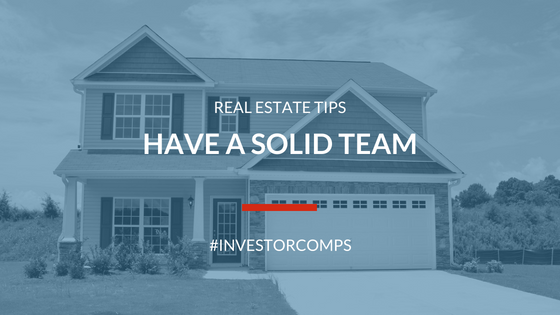 As we move forward with my investment tips next time, I want to discuss knowing your market area and the importance of doing your research prior to purchase.